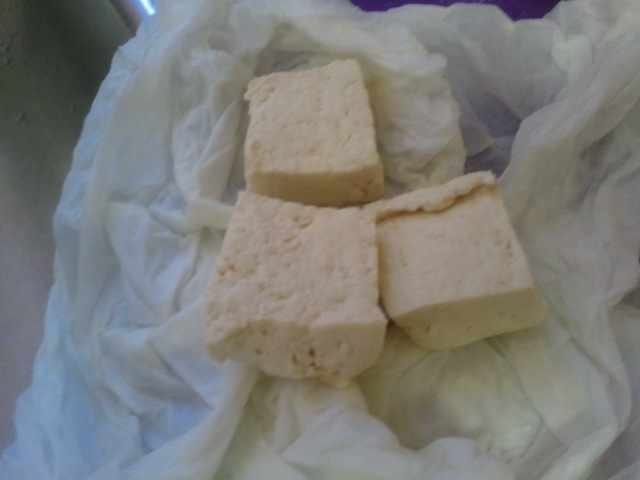 You can’t get easier than this 3 ingredient tofu recipe. Especially since the BBQ sauce comes from a bottle. Make sure you pick something quality, as there are a lot of junky, non-vegan, and non-delicious ones available on the market. I like to jazz mine up with a little hot sauce, agave and mustard, but that part’s totally optional depending on the sauce you use. DO make sure you press the tofu first, though. It doesn’t have to be a 30-60 minute press. 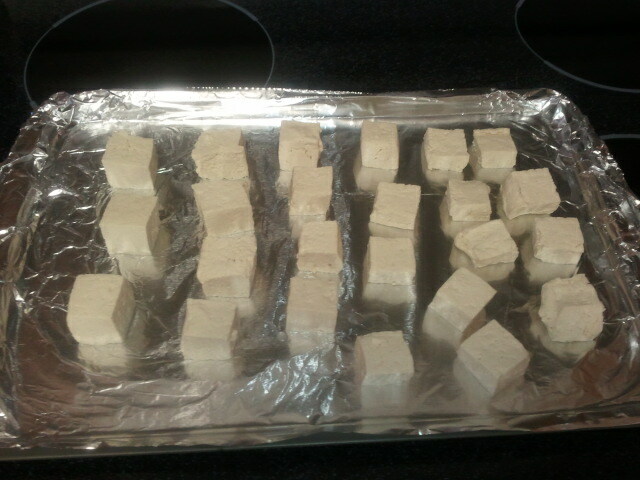 Check out my directions at the bottom for quick pressing tofu cubes! 1. 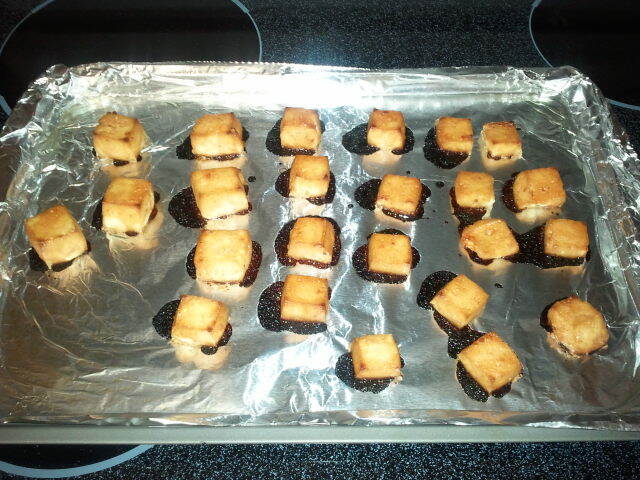 Preheat oven to 450*F. Spray or grease a cookie sheet with canola oil. 3. Meanwhile in a medium bowl, whisk BBQ sauce with additional ingredients to taste, if using, and set aside. 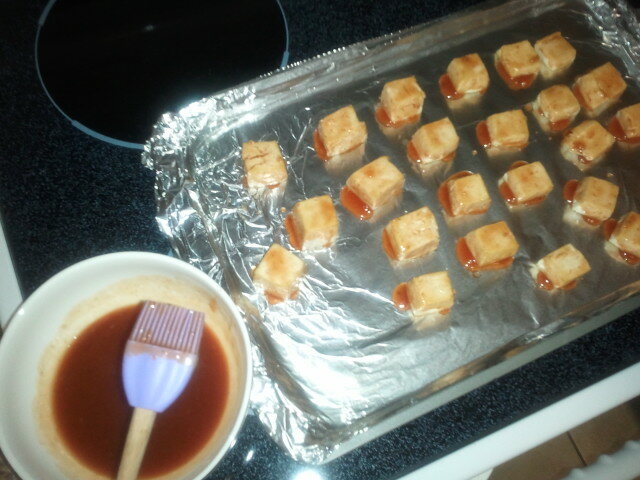 After tofu bakes for 15 minutes, brush with BBQ sauce and place back in oven for additional 10-15 minutes. Reserve sauce. 4. 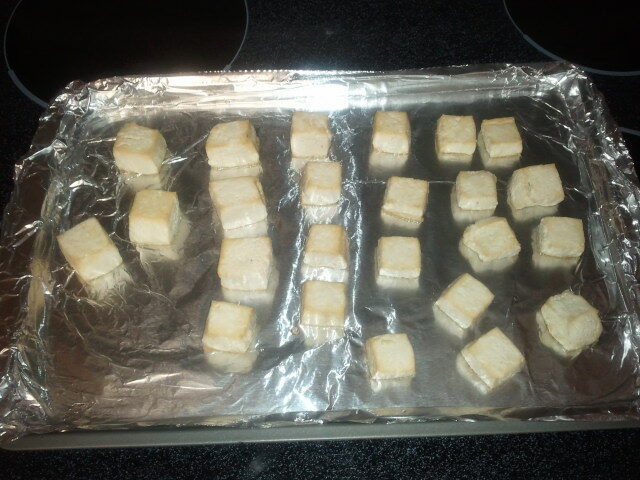 Remove the tofu from oven and let it cool slightly. 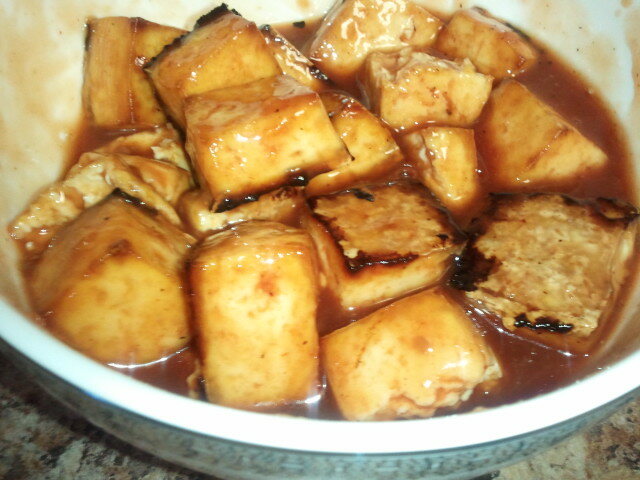 Drop tofu pieces into bowl with sauce and coat evenly. You can serve this with rice and veggies, or mashed potatoes, fries, whatever you like! **You could make this even easier by skipping the basting in step 3, baking the tofu for 25-30 minutes, and then doing step 4. Up to you. 1. 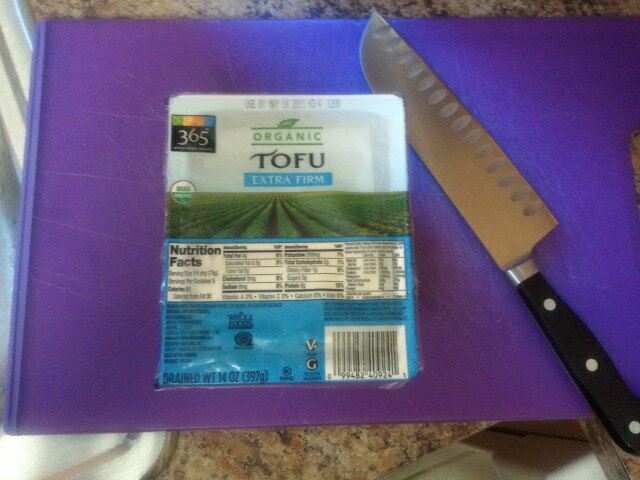 Remove tofu from package and gently squeeze between your palms over the sink. 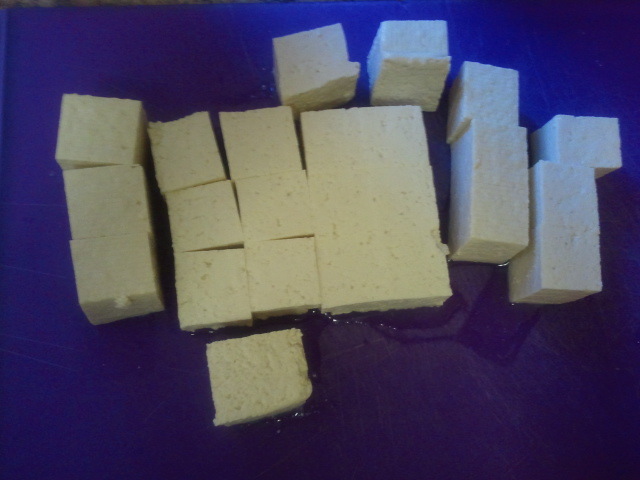 Place tofu on cutting board. 2. 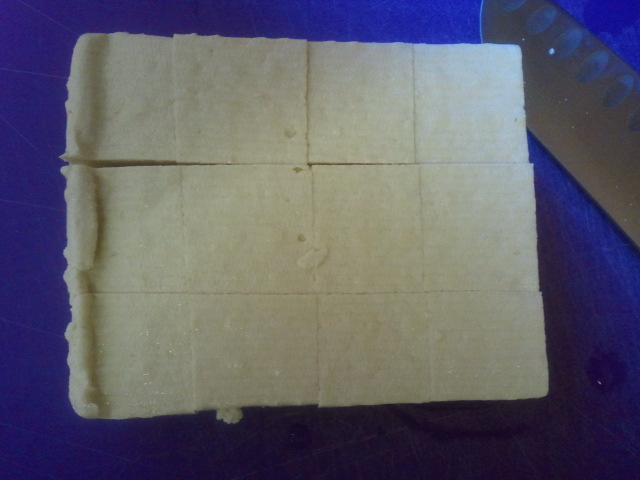 Cut into desired size cubes. I usually make 4 cuts along the length, 3 cuts along the width, and then cut the height in half. 3. Grab a couple of paper towels and wrap around 3-4 cubes at a time. Gently squeeze out over the sink. Don’t squeeze so hard that you crumble your tofu, but just enough to get some of the water out. Continue with remaining cubes.